The diagnosis of cardiac tamponade as a result of pericardial effusion was originally described in 1935 by Dr. Claude Beck as the clinical exam triad of muffled heart sounds, jugular venous distention, and hypotension. However, clinicians have since recognized that patients with symptomatic pericardial effusions may not display these classical clinical examination findings. Currently, the availability of bedside ultrasound in the emergency department (ED) has allowed for more rapid diagnosis of pericardial effusions and cardiac tamponade. Two cases are presented here to highlight how bedside echocardiography can potentially facilitate the timely diagnosis of pericardial effusions and cardiac tamponade. Furthermore, these cases will demonstrate how bedside echocardiography can help differentiate between patients with a compensated effusion from those with tamponade physiology. A 71-year-old male with a history of metastatic prostate cancer currently undergoing palliative chemotherapy presents to the ED complaining of weakness, fatigue, and shortness of breath. Initial vital signs were as follows: blood pressure 80/40, heart rate 120, respiration rate 22, temperature 99.6°F, O 2 saturation 92% on right atrium. On physical examination the patient appears ill, with respiratory distress. Cardiac auscultation is significant for tachycardia. Jugular venous distention is present to the angle of the mandible. Electrocardiogram (EKG) reveals a low voltage tracing with sinus tachycardia. Bedside ultrasound reveals a circumferential pericardial effusion, with a hyperdynamic left ventricle. Closer examination demonstrates collapse of the right ventricle during diastole [Figure 1]. Furthermore, the inferior vena cava (IVC) is distended, with loss of normal respiratory variation [Figure 2]. A 66-year-old man with congestive heart failure presents to the ED complaining of progressive shortness of breath over the last month. Initial vital signs are as follows: blood pressure 180/100, heart rate 66, respiration rate 16, temperature 98°F, O 2 saturation 97% on right atrium. The patient appears comfortable. Clinical examination is remarkable for quiet heart sounds and rales at the left base. EKG shows normal sinus rhythm with low voltage. Chest radiography reveals cardiomegaly and a left side pleural effusion. Bedside echocardiography demonstrates a circumferential pericardial effusion with depressed left ventricular function. On further examination, there is subtle evidence of collapse of the right atrium during diastole, without simultaneous collapse of the right ventricle [Figure 3]. 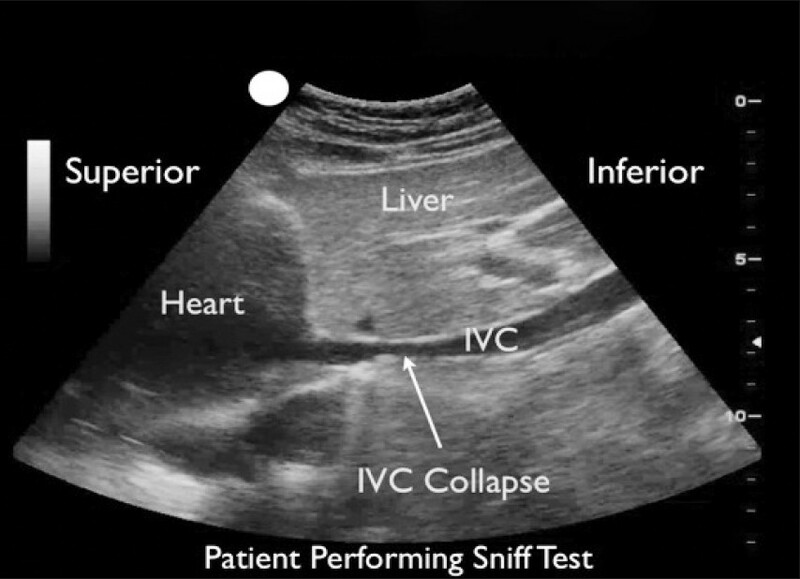 The IVC is small in diameter, with normal respiratory variation [Figure 4]. 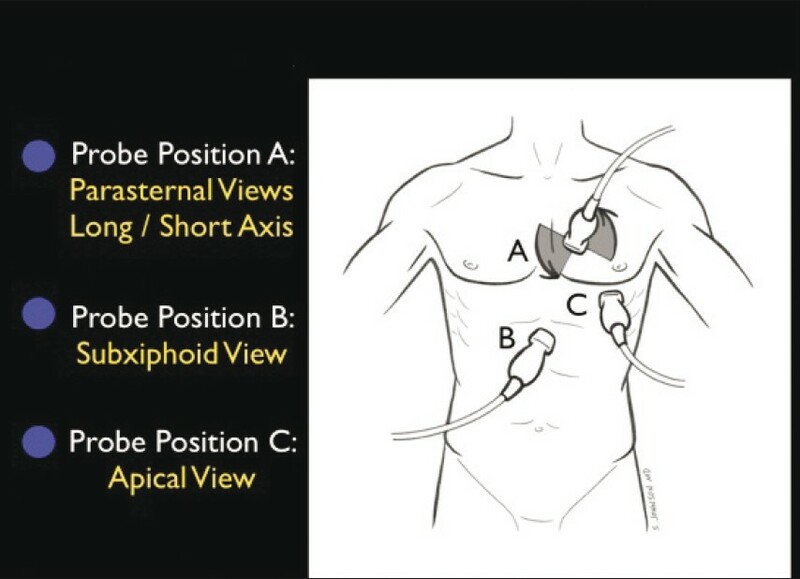 The initial examination of the heart via transthoracic echocardiography should be performed utilizing one of the standard four views: parasternal long and short axis, subxiphoid, and apical [Figure 5]. A pericardial effusion will appear as a dark, or anechoic, stripe surrounding the heart. Smaller effusions will appear as a thin stripe inside the pericardial space, often not extending fully around the heart and usually layering out posteriorly with gravity. Small effusions should not be confused with a pericardial fat pad, which will appear as an isolated dark area with brighter speckles, located anteriorly. Larger effusions are more likely to be circumferential, seen both inside the near and far-field pericardial surfaces. Occasionally, pericardial effusions may be loculated and compress only a portion of the heart. This is more common with post-cardiac surgery patients. One potential pitfall in the diagnosis is that pleural effusions may be confused with pericardial effusions. The parasternal long-axis view can be used to accurately define the effusion. The descending aorta will appear as a cylinder posterior to the mitral valve and left atrium. The posterior pericardial reflection is located anterior to this structure. Fluid anterior to the posterior pericardial wall is pericardial, while fluid located behind is pleural [Figure 6]. Pericardial effusions can result in hemodynamic instability as the pressure in the thick fibrinous pericardial sac increases, reducing cardiac filling. Pericardial effusions as small as 50 ml may cause acute tamponade. Conversely, in chronic conditions, the pericardium may stretch to hold large effusions without tamponade. As pericardial effusions accumulate and the pressure in the sac rises, the lower pressure circuit of the right side of the heart is affected first. Cardiac tamponade is thus classically defined as the collapse of either the right atrium or the right ventricle during the diastolic phase of the cardiac cycle. Ultrasound findings can range from a subtle inward serpentine diastolic deflection of the right atrial or right ventricular free wall to complete diastolic collapse of the chamber wall. When examining a patient for potential tamponade, it is important to distinguish between the physiologic contraction of the heart during systole from pathological collapse during diastole. Right atrial collapse may be especially difficult to identify, as atrial systole can often mimic diastolic collapse, especially in the tachycardic patient. Thus, it is crucial to accurately identify the diastolic cardiac phase from systole. Additional information can be gained by imaging the IVC for signs of increased central venous pressure (CVP). This is done by examining both the absolute size of the IVC and its variation in size throughout the respiratory cycle. A simple method of identifying the IVC is to first view the heart in the subxiphoid four-chamber view. The probe is then angled inferiorly, imaging the IVC as it joins the right atrium. The IVC should be examined inferiorly, past the point of confluence of the hepatic veins, usually about 2 cm distal from the heart. This allows the clinician to determine the size of the IVC in the short-axis view, potentially providing the most accurate measurement by avoiding the cylinder effect. The IVC can also be evaluated in the long-axis view by rotating the probe to a position with the indicator oriented vertically. By moving the probe slightly toward the patient's right, the IVC should come into view adjacent to the aorta. 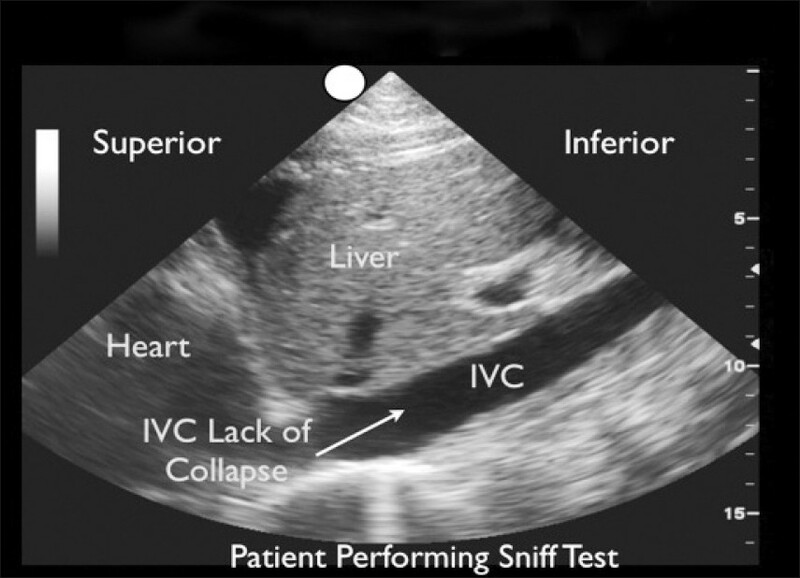 An enlarged IVC that is greater than 2 cm in diameter and that collapses less than 50% with inspiration, or a forced sniff maneuver, correlates with a CVP greater than 10 cm H 2 O. ,, Conversely, a smaller IVC less than 2 cm in diameter that collapses greater than 50% with inspiration, or sniff, correlates to a CVP less than 10 cm H 2 O. The finding of IVC plethora with loss of respiratory collapse, signifying elevated CVP, is confirmatory echocardiographic evidence of tamponade. Using Doppler mode, changes in blood flow across the cardiac valves can be seen that indicate cardiac tamponade. Normally, there is some variation in flow across the valves due to the respiratory cycle. During cardiac tamponade, this respiratory variation in blood flow across the valve is exaggerated. This can be best visualized by imaging at the level of the tricuspid valve and looking for a larger inflow of blood during inspiration as compared to expiration. While these advanced echocardiographic findings may be helpful in the diagnosis of acute tamponade, severe hypovolemia or right ventricular hypertrophy may obscure these signs. In the two clinical scenarios described above, both patients had large pericardial effusions. However, bedside echocardiography allowed for accurate determination of the patient who had acute cardiac tamponade necessitating an emergent pericardiocentesis from the patient who had a compensated effusion, where delayed pericardiocentesis by cardiology could be performed. The patient in the first case is clinically in a state of shock. These clinical findings, in combination with the bedside echocardiography findings of a circumferential effusion with right atrial and ventricular diastolic collapse and a plethoric IVC with loss of respiratory variation, represent an obstructive shock state due to tamponade. 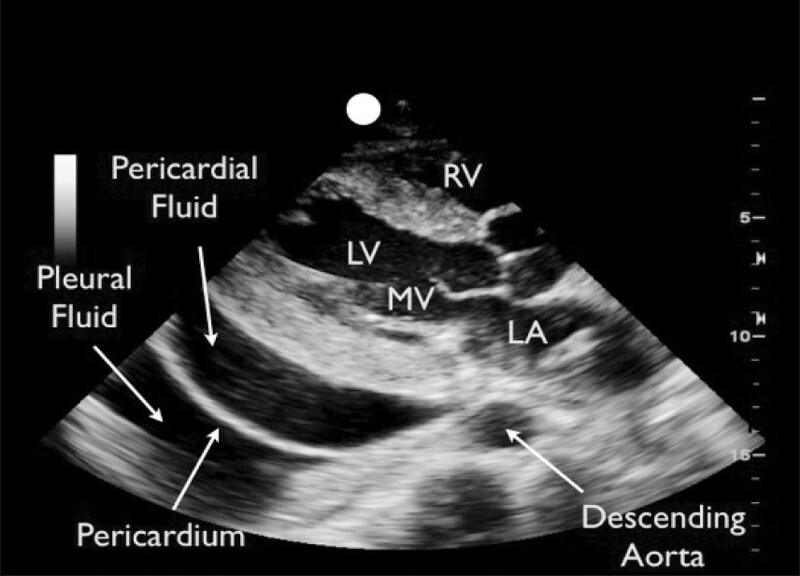 In the unstable patient with clinical and echocardiographic findings of tamponade, an emergent pericardiocentesis is indicated. Traditionally, pericardiocentesis has been performed via the subxiphoid approach. More recently, it has been found that the optimal approach was determined by using echocardiography. In the majority of cases in the study, this was best achieved from the apical approach, with the patient in the left lateral decubitus position, under real-time ultrasound guidance of the needle. While the patient presented in the second clinical scenario appears clinically stable, the situation can actually be more challenging to manage. The patient's presentation suggests an exacerbation of congestive heart failure. However, bedside echocardiography demonstrated a large, circumferential pericardial effusion. The question of whether rapid pericardiocentesis was indicated was best answered by further evaluation of the ultrasound findings. While subtle right atrial diastolic collapse was noted, there was no simultaneous collapse of the right ventricle or plethora of the IVC. These ultrasound findings were consistent with early, or compensated, tamponade physiology. In this case, there was time for a cardiology consultation and more detailed specialty evaluation. Due to the absence of definitive ultrasound features of tamponade at that time, the patient was admitted to the cardiac care unit with plans for close observation and a scheduled pericardiocentesis for the next day. In conclusion, bedside echocardiography has been shown to rapidly and reliably diagnosis pericardial effusion and tamponade. In the cases highlighted here, the benefits of bedside ultrasound can be seen in both the stable and the unstable patient with a pericardial effusion and potential tamponade. 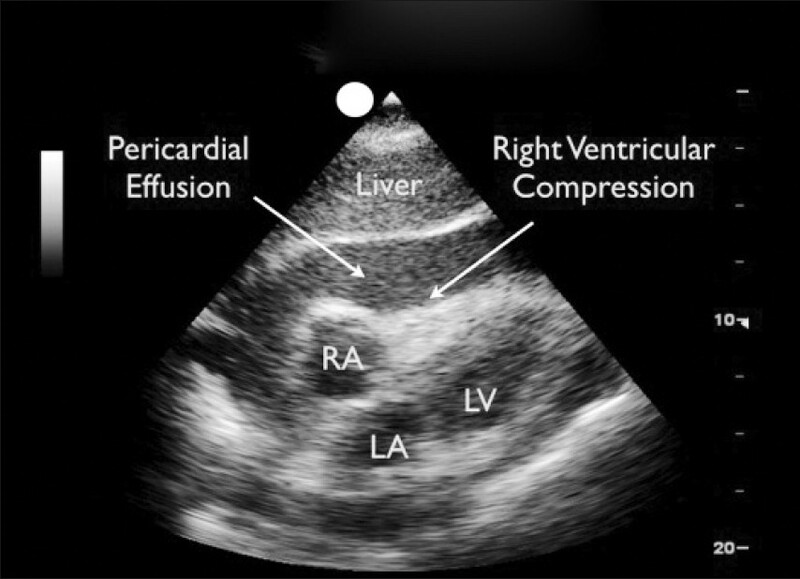 Clinicians caring for these patients can rapidly incorporate these ultrasound techniques into their practice to more accurately diagnose cardiac tamponade and to potentially achieve improved treatment outcomes. 1. Levine MJ, Lorrell BH, Diver DJ, Come PC. Implications of echocardiographically assisted diagnosis of pericardial tamponade in contemporary medical patients; detection before hemodynamic embarrassment. J Am Coll Cardiol 1991;17:59-65. 2. Mandavia DP, Hoffner RJ, Mahaney K, Henderson SO. Bedside echocardiography by emergency physicians. Ann Emerg Med 2001;38:377-82. 3. Perera P, Mailhot T, Riley D, Mandavia DP. The RUSH Exam: Rapid ultrasound in shock in the evaluation of the critically ill. Emerg Med Clin N Am 2010;29-56. 4. Blaivas M. Incidence of pericardial effusion in patients presenting to emergency department with unexplained dyspnea. Acad Emerg Med 2001;8:1143-6. 5. 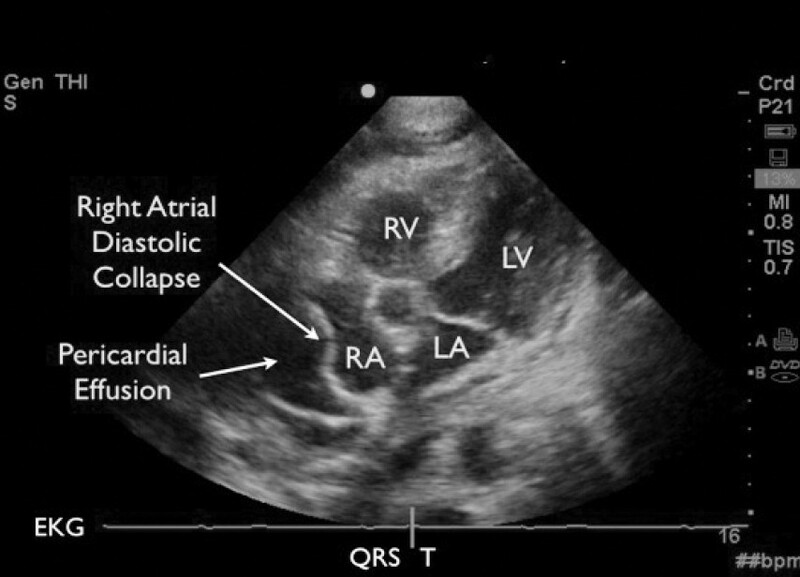 Nagdev A, Stone M. Point-of-care ultrasound evaluation of pericardial effusions; Does this patient have cardiac tamponade? Resuscitation 2011;82:671-3. 6. Kircher B, Himmelman R. Non invasive estimation of right atrial pressure from the inspiratory collapse of the inferior vena cava. Am J Cardiol 1990;66:493-6. 7. Simonson JS, Schiller NB. Sonospirometry: A new method for non-invasive measurement of mean right atrial pressure based on two-dimensional echocardiographic measurements of the inferior vena cava during measured inspiration. J Am Coll Cardiol 1988;11:557-64. 8. Feigenbaum H, Armstrong WF, Ryan T. Feigenbaum's Echocardiography. 6 th ed. Philadelphia: Lippincott, Williams and Wilkins; 2005. 9. Tsang TS, Enriquez-Sarano M, Freeman WK, Barnes ME, Sinak LJ, Gersh BJ, et al. Consecutive 1127 therapeutic echocardiographically guided pericardiocenteses: Clinical profile, practice patterns and outcomes spanning 21 years. Mayo Clin Proc 2002;77:429-36.